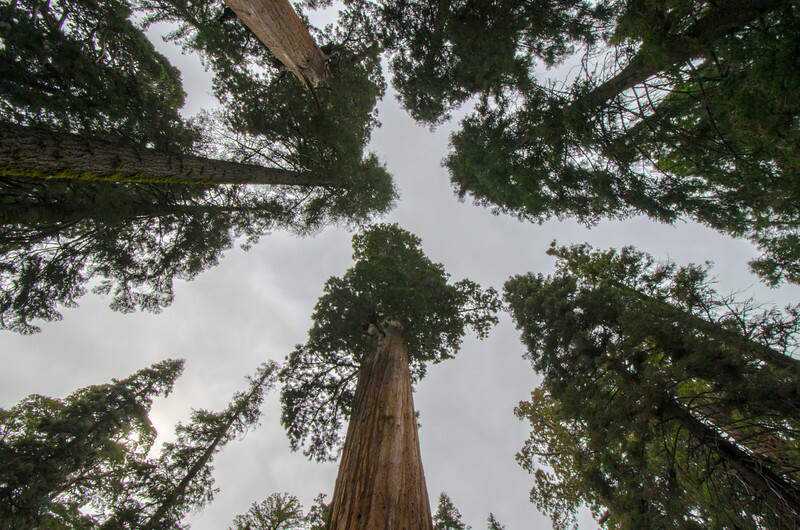 Because no one has ever thought to point a camera with a wide-angle lens straight up in a grove of giant sequoia trees!! Photo was taken in Grant Grove in Kings Canyon National Park in California. May I just editorialize for a moment about the visitor experience in Grant Grove? •One d-bag walking around with his phone blaring some kind of terrible music. I guess his soundtrack has to be everyone's soundtrack. •Another total d-bag climbing on a tree, just beyond a sign saying "don't climb on the trees." •Numerous small kids running around and screaming their lungs out. I know the breeder crowd out there will be putting the hate on me for saying this, but national parks are not playgrounds. Sorry! •Four outhouses -- I kid you not -- that the National Park Service had placed directly under four sequoia trees near the massive parking lot. The sad fact is this: three of the grandest groves of the largest trees on Earth have been turned into Industrial Tourism experiences; I'm referring to the Mariposa Grove at Yosemite, the Giant Forest at Sequoia N.P. and Grant Grove at Kings Canyon. If you're going to visit any of these three and enjoy a little effin' peace-and-quiet in nature, my advice is go very early in the morning or wait until winter and visit on cross-country skis or snowshoes, preferably on a weekday. Even better, visit one of the other lesser-known groves of giant sequoias scattered around the western Sierra.